I’m very much a “When in Rome do as the Romans do.” kind of gal. When I visited Hong Kong, I walked through electric street markets, made my way to the Tian Tan Buddha and drank my weight in milk tea. While in Bali, I had an Eat, Pray, Love moment while riding a bicycle through temple-lined streets and around rice fields; I fed a monkey a banana at the Ubud Monkey Forest; and I learned how to surf with the long-running Goddess Retreats. While in Dubai, I visited the tallest building in the world, the Burj Khalifa, as well as the largest mall in the world, The Dubai Mall, and I strolled through a gold souk. Following suit, on my most recent wintery adventure in Whitefish, Montana, I, of course, did the thing you’re supposed to do: play outside. The culture in many cold-winter Montana towns often includes a hibernation of sorts, but not in Whitefish—folks there find a way to sweat year round. The temps were in the teens while I was visiting with my family but that certainly didn’t slow us down—this little mountain town offered a plethora of outdoor activities to keep us engaged, inspired and, yes, sweating. Check out the below five winter Whitefish happenings and then mark your calendar for a visit—you won’t regret it! The last time I went skiing was when I was a teenager—I tore my ACL in a brutal accident and never skied again. So, to say that I was bit nervous to click into skis again, 20 odd years later, is an understatement. I signed up for a group ski lesson at Whitefish Mountain Resort (http://skiwhitefish.com/) and it’s the best thing I could have done. Turns out skiing is like, well, riding a bike—muscle memory is a real thing! I quickly picked skiing up again by the end of the half day lesson and it’s all due to getting over my mental hurdle. My kids, first-time skiers, were zipping down green runs by the end of their two-day lessons. I’m happy to say that we are now a skiing family and I can’t wait to come back to Whitefish Mountain Resort! Pro tip: Kandahar Lodge at Whitefish Mountain Resort is the best place to stay—it’s a stone throw from the mountain. You’ll love the large cozy fireplace, complimentary breakfast every morning, outdoor hot tub and the storage room for skis and boots—you don’t have to schlep them all over the place. And, whether you stay at the lodge or not, definitely check out Café Kandahar—the insightful and creative winter tasting menu, with wine pairings, is not to be missed. Plus, the Executive Chef and Owner, Andy Blanton, could not be friendlier—you’ll see him make his way from table to table, greeting patrons and thanking them for coming. You can’t go all the way to Northwest Montana and skip seeing one of the most stunning National Parks our country has to offer. And, exploring Glacier National Park in the winter is truly a treat—no stifling crowds and bumper-to-bumper traffic. 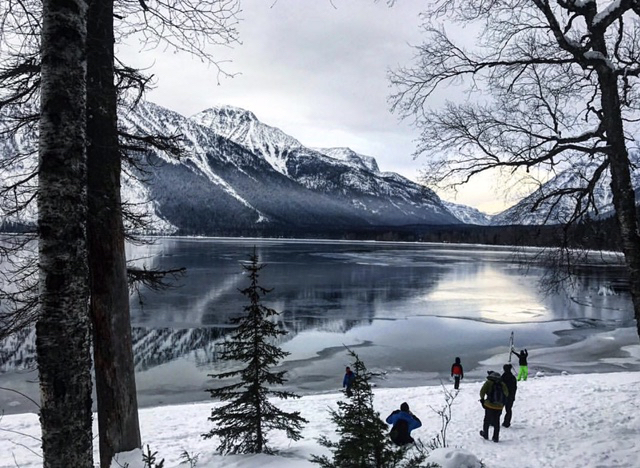 We trekked in the snow to Lake McDonald and then to McDonald Falls—four miles round trip—with Glacier Adventure Guides. My boys whipped rocks at frozen Lake McDonald, which made the most haunting music-bowl sound that my ears have ever heard. The best part: we didn’t see another soul—it was quiet in an almost ear-splitting way (I know that sounds like an oxymoron), except for the sounds of my feral boys adventuring and the crunch of the snow under our boots. The Whitefish Bike Retreat, an awesome facility that offers lodge accommodations and campsites along maintained property trails that ultimately link up with The Whitefish Trail, is owned and operated by one of the most badass and charming women in Montana, Cricket Butler. She created the retreat in 2013, with her two sons in tow, because, as an experienced cyclist, she wanted a space where bike enthusiasts could come together and focus on one thing: riding. Young and young-at-heart will love the bumps and berms on the Pump Track, the obstacle-laden Skills Area and the Ridge Deck, where panoramic views can be enjoyed. Of course, in the winter everything is covered in snow. Enter: fat bikes. Riding a fat bike in the snow is not easy but it’s fun and I promise, you’ll laugh harder than you have in a long time as you fall into the deep snow (or watch your loved one take a dive) when your bike gets stuck or when you cruise down the packed snow, not even caring that your wind-licked eyes are making tears freeze on your face. At the base of Spencer Mountain, just outside of downtown Whitefish, sits Bar W Guest Ranch, a year round dude ranch that offers rustic cabin suites, glamping and main lodge accommodations. And, in the winter months, what could be cozier than snuggling in fluffy blankets while riding in a horse-pulled sleigh? Beautiful draft horses, guided by beautiful cowboys, mosey through open fields, pastures and along wooded trails. At the end of the peaceful ride, you’ll sip hot cocoa and nosh on cookies by the fireplace in the main lodge. Now, how perfect is that?! Not only can you get a stellar meal and a nice glass of wine at The Lodge at Whitefish Lake, but also you can unwind in the outdoor hot tub, gaze at the stars, play on the frozen-over Whitefish Lake (ice fishing, ice skating, snow shoeing, cross country skiing, etc.) and indulge in a spa treatment at the newly renovated Spa at Whitefish Lake. It was almost as if each morning someone on a radio said, “Cue the deer, the Altschulers are looking out the window!”, because before each sunrise, we saw beautiful woodland creatures make their way across the lake in the snow. Yes, this lodge is that picturesque and dreamy.